Eggnog Cocktail is perfect for the holidays, this classic cocktail consists of chilled eggnog, amaretto , and vodka. When I first think of Christmas, usually eggnog is one of the first things that comes to mind in regards of food and drink for a Christmas feast. When we were kids, my sister and I use to request our eggnog in a fancy glass like the adults get for their Christmas cocktail. We would casually sip our eggnog out of our teeny tiny shot glasses with our pinkies out. So sophisticated …haha. It’s one of the highlights of Christmas as a little kid. The only time we used fancy china and were able to drink out of fancy glasses VERY carefully. 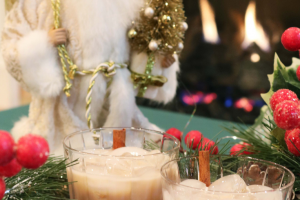 Eggnog cocktail is that perfect holiday drink. The flavors of cinnamon and eggnog swirl through your mouth in such a heavenly tune. I swear you can hear Christmas music in your ears as you drink it. But seriously, eggnog is never around for long, so if you love it, you should definitely give this drink a try. It is so creamy and rich and will give you perfect little Christmas dreams as you pass out from all the food and holiday cheer. It’s a Christmas tale well worth it. In a shaker filled with ice, add in vodka, amaretto and eggnog. Shake well. Pour into glass- strain ice. Add a pinch of nutmeg on top. 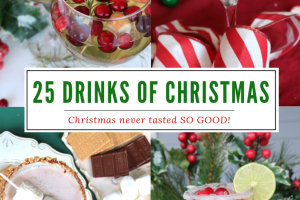 If you are just tuning in for 25 drinks of Christmas, don’t forget to check out all the other Christmas party drinks. 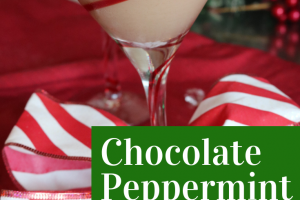 This is Day 7 of holiday cocktails so you have plenty left to enjoy!